I owe the blog a post about our trip to the Bahamas and on my 200 day writing record but the day job is getting in the way at the moment. Maybe tomorrow. In the meantime, here’s some more belated metrics. 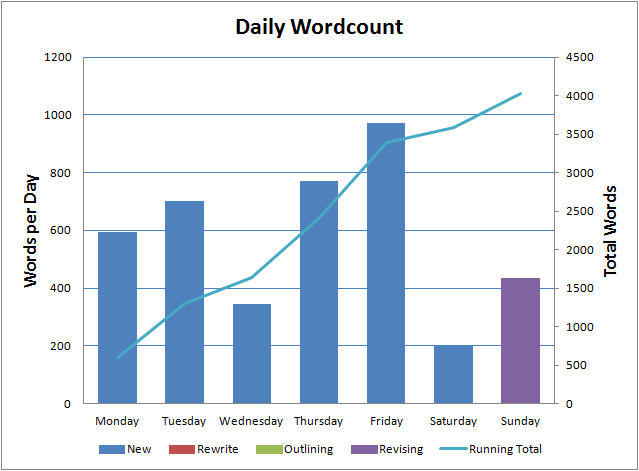 A total of 4023 words for the week. It would have been higher but Saturday’s writing session was interrupted by a fire alarm (false) and on Sunday I returned to revisions of The Ghost Smuggler which naturally leads to lower word counts. I’m expecting a low word count for the next few weeks for that reason and this week is already shaping up to be far less productive (as far as pure number of words goes anyway).